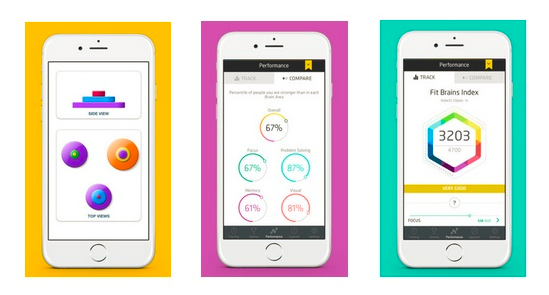 Fit Brains is a web- and mobile-based cognitive training app. It is based on brain-stimulating games and focuses on 6 areas of cognitive functioning: Memory, Speed of Thinking, Concentration, Problem Solving, Language, and Visual-Spatial. It also targets Emotional Intelligence in 4 key areas: Self-Control, Self-Awareness, Social Awareness, and Social Skills. Games are easy to learn, short, and varied, and the difficulty of each game adjusts to the user’s personal performance. A session is comprised of 4 games, each taking up to a few minutes. Users can decide how many sessions to complete or practice in a specific area based on personal preferences or scores in previous training. At the end of each game, users receive feedback on their performance and view their cumulative score. Scores can be compared with other Fit Brains users in the same age group in order to evaluate performance.